For the 8th year, Cannes is celebrating the best in fashion photography with an exhibition in a number of venues around town. 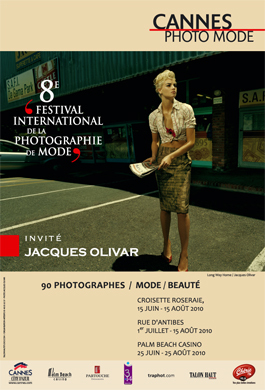 This year, the International Festival of Fashion Photography invited the noted fashion photographer Jacques Olivar. The Palm Beach Casino, main partner of this event, hosts on its cymas the 2010 selection of contemporary photography creation. Ninety fashion photographers from different backgrounds present their creations on 1 m x 1.50 m printings. On the terrace of the Palm Beach Casino, a selection of 32 photographs among Jacques Olivar’s work shows the great strength of his pictures, printed on 3 m x 3 m sheets and put on spotlighted structures, so that the exhibition can be seen day and night.